Reconstruction of the funerary temple of Nebhepetr Mentuhotep, at Deir el-Bahri, Thebes. Middle Kingdom, Eleventh Dynasty.c. 2070-2019 BC. The funerary complex of Mentuhotep consisted of a pyramid surrounded by a columned hall and ambulatory, the whole raised on a platform fronted by porticoes, and approached by a ramp. 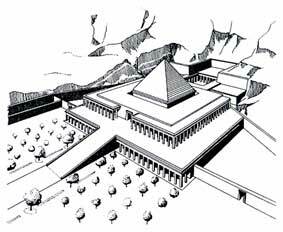 Behind the pyramid and on the same level was colonnaded court and a columned hall cut into the rock, beneath which was the tomb of the king.